As I'm working on this post, we're watching the live production of The Sound of Music. Did you see it? I'm so proud of our Oklahoma girl Carrie and those children were amazingly talented! After the tray garland and tray wreath, I hope you're not tired of seeing projects made with my dollar store silver trays, but I promise this is the last one! Cousins together at my sister's wedding! 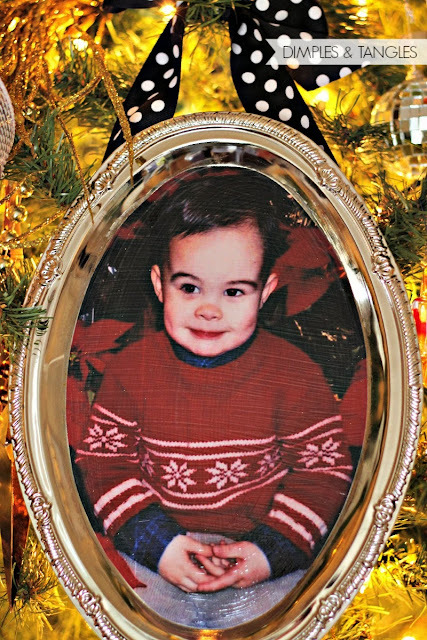 One thing I especially enjoy displaying at Christmas is photos of my kids from past Christmases. Mommies of little ones, they really do grow too fast! 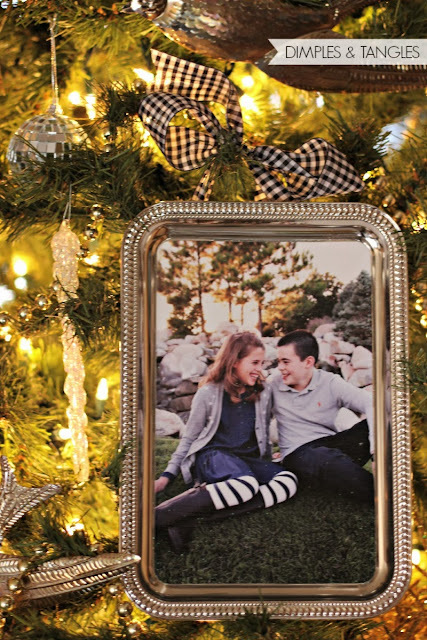 Being able to add these precious memories to the tree makes them even more special, and these trays make the perfect frame to use. The only supplies needed are the metal trays, a printed photo, mod-podge, a foam brush, ribbon, and a hot glue gun. Trim the photo to fit just inside the bottom of the tray. For the rectangular trays, my paper trimmer worked great and a corner rounder punch was perfect to match up the corners. On the oval tray, I traced the bottom on a piece of wax paper and cut it out. 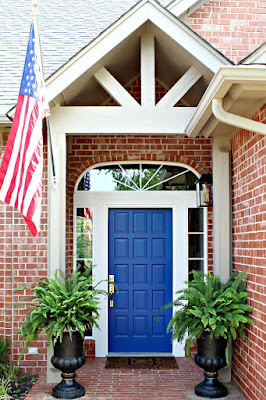 Then, I could lay that transparent pattern exactly where I wanted it over the photo and trim. 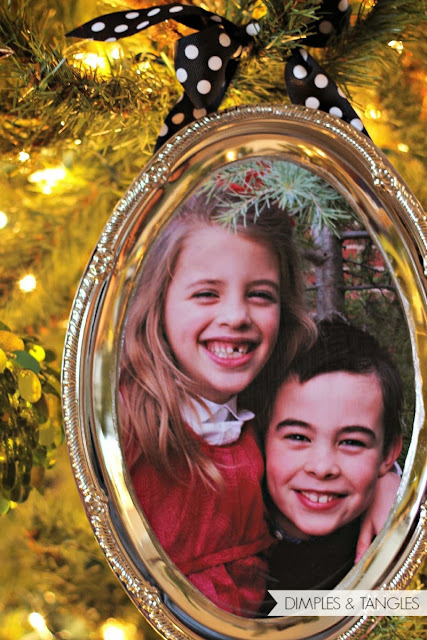 Just to get a feel for the size of these ornaments, the photos I printed were 8x10 and I just did a little bit of trimming off the edges. So, they take up quite a bit of room on the tree. 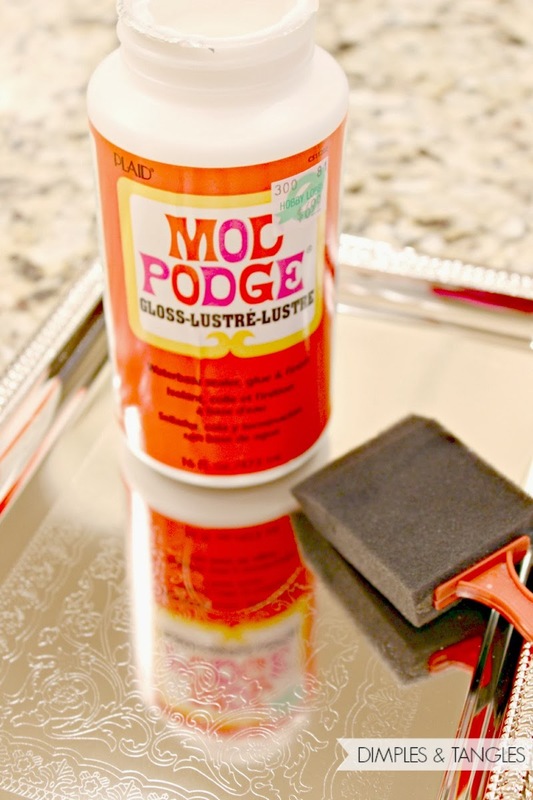 After your photo is trimmed, brush a coat of mod-podge on the bottom of the tray and stick your photo down to it. Let that dry for a little while, and then paint a coat of mod-podge on top of the photo, covering it completely. While applying the first coat of mod-podge, I kept the brush strokes consistently going all one way. On the second coat, I made the brush strokes go the opposite way. I found this gave more of a "canvas finish" look. My baby and her favorite bun-bun. My heart. Speaking of babies, my almost 2 year old little guy...smooch! I let mine dry overnight, and then used hot glue to attach a ribbon to the back to hang them with. I know I'll enjoy pulling these out to use year after year! 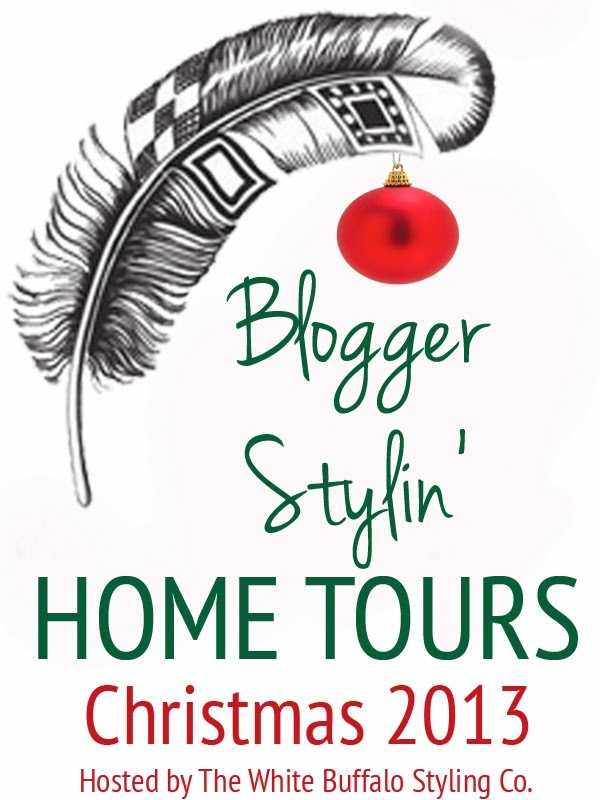 You're getting just a tiny peek of my tree, I'll show you the rest next week when I'm honored and so excited to participate in 2 home tours. On Thursday, I'll be hanging out with over 50 bloggers for the Blogger Stylin' Home Tours hosted by Lindsay at The White Buffalo Styling Company. 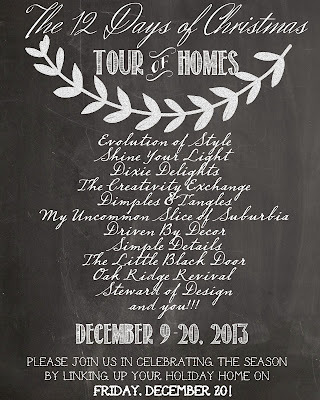 Then, on Friday I'll be sharing in The 12 Days of Christmas Tour of Homes hosted by Jenny at Evolution of Style. 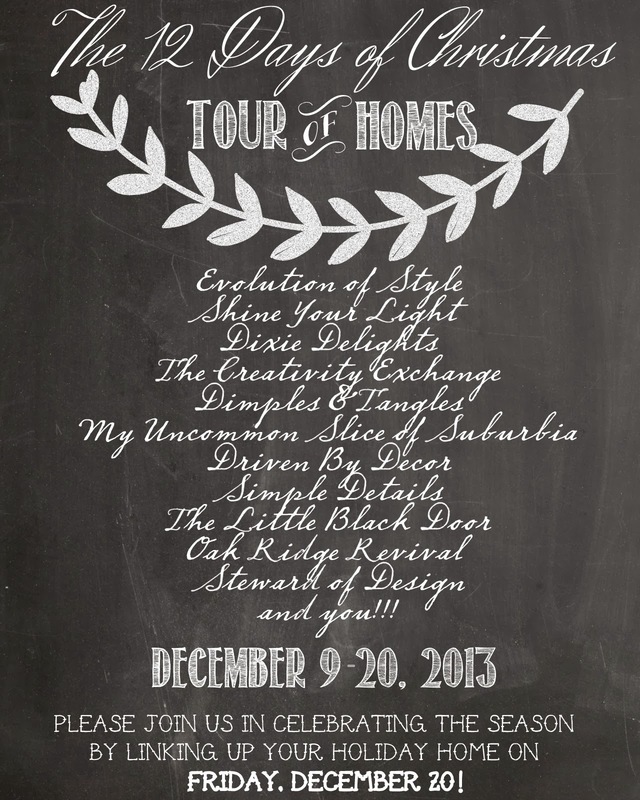 Check the schedule for both tours and follow along. There's sure to be some major holiday inspiration! I hope you all have a fabulous weekend...we're out for a snow day today! 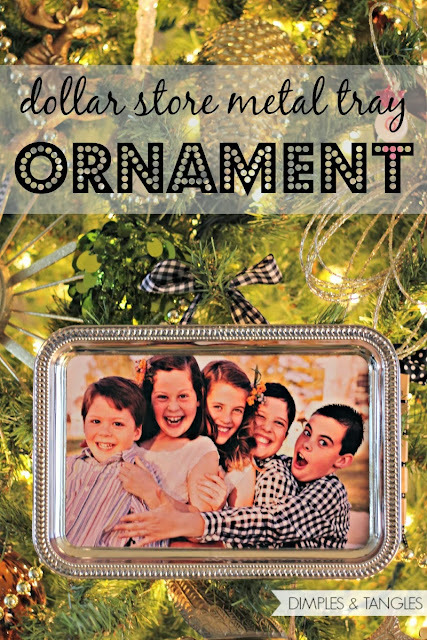 Linking up with Hi Sugarplum and Michaela Noelle Designs for the Holiday Craft Party! 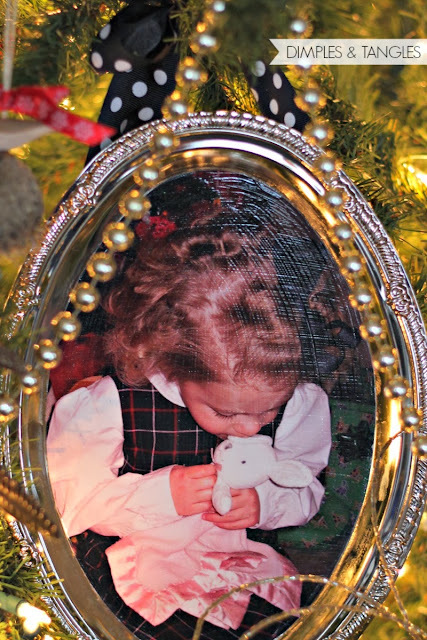 Also linking up with Fox Hollow Cottage for the Dollar Tree Christmas Ideas Party. what a cute idea! i love these- sweet and thoughtful and shiny and pretty, too! Love these Jennifer! Those babies!! Where does the time go? 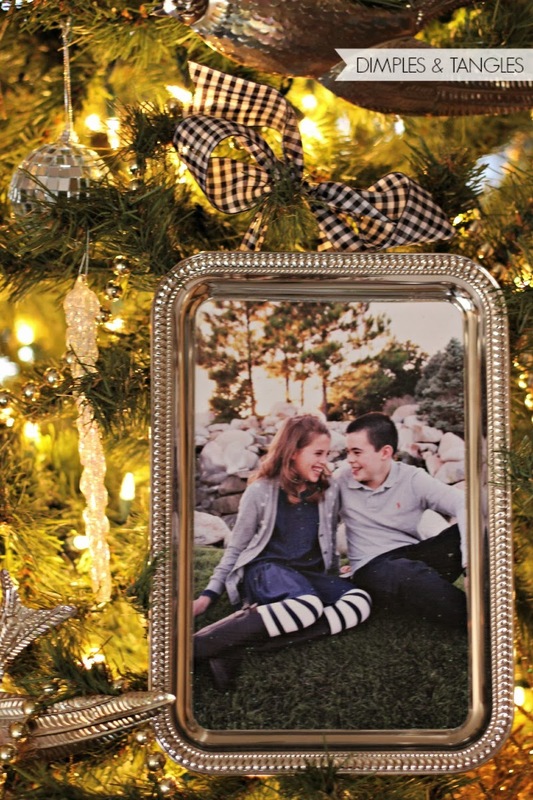 This is such a great idea… I love pictures of my children on the tree, it really does give it a personal touch! And your little ones are so adorable! Thanks for sharing. Awwww - your babies are so adorable through the years! 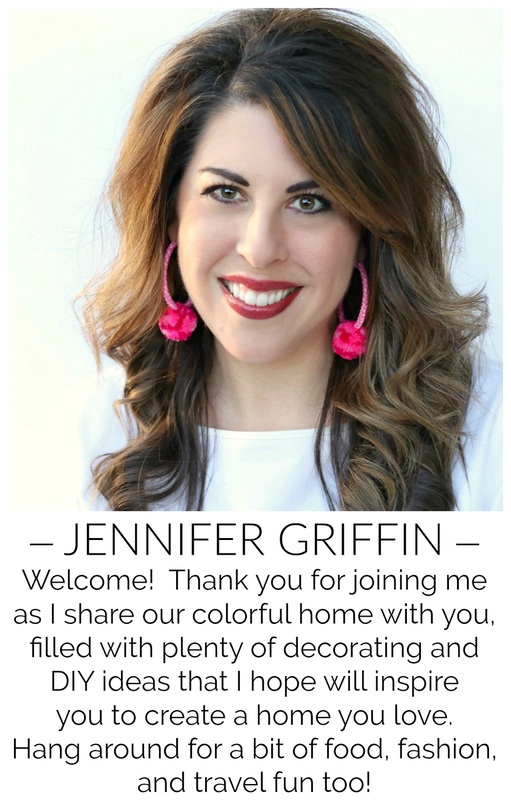 Love this idea Jennifer. You are really getting creative with the dollar store trays girl! I'm impressed at your ingenuity! Have a wonderful weekend my friend! These came out so cute. Adorable little faces!! So very cute - thanks for sharing - you have a beautiful family. Girl, where does your creativity end?! So clever, I love it! I think this one is the cherry on top and my favorite! And no I'm not sick of it at all. I love it! That's a great idea! Those pictures of your kids are adorable! Love it! I'm going to have to go get more trays. What a cute idea! Love how you've been using those trays! I have been looking for memorial ornaments to give my siblings. Our father passed away this summer. This is the BEST idea I have seen! I have never used mod podge before, how much should I buy for 5 of these? Oh Tammy, I LOVE that idea! How sweet! It won't take much at all! Definitely one jar is plenty. I think they even sell smaller containers that would be enough for 5. Just make sure you let them dry really well for several days, they will stay tacky for a while. OK, one more comment from me, I went to the dollar store, hoping to find the smaller sized trays, and they didn't have any, not even the coasters in that material. I bought little octagon mirrors that are for holding candles. You think they will work? I have never done anything like this before. Yes, I think that would work fine, just a different look. 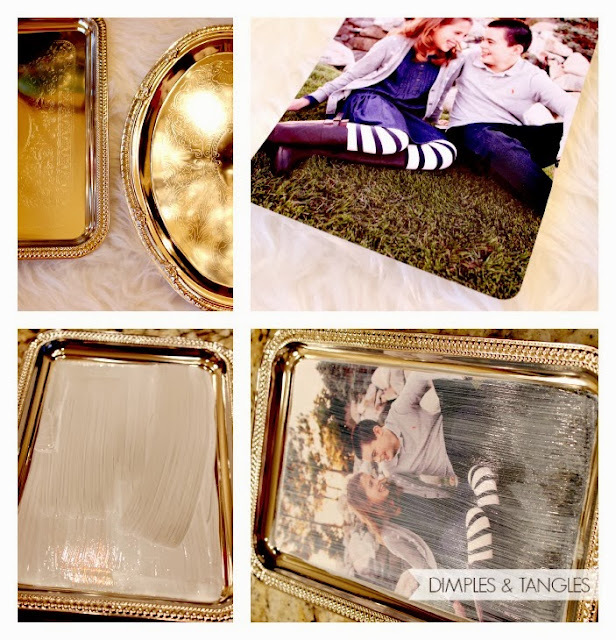 I really like the trays because the raised edge gives the photo a framed effect. Did you look at Dollar Tree specifically? That's where I found mine. I did, but all they had were the big ones like 7X11 or so. I didn't want anything that big.